The festivity of the year is on. Milan veteran Leo Gullbring gives you the ultimate guide to the design capital – among showrooms and Bars, streets and galleries. Form has also visited ArkDes again, for a follow-up report on the situation there. You can read about the last visit in Form 5/2014, when Bo Madestrand interviewed the then acting manager Kerstin Brunnberg. In Form 2/2019, reporter Leonidas Aretakis has met current manager Kieran Long to talk about the organization. In addition: a photo report from Swedish hydroelectric power stations along the Indalsälven river, interviews with the design studio Butler / Lindgård and the textile artist Pasi Välimaa. 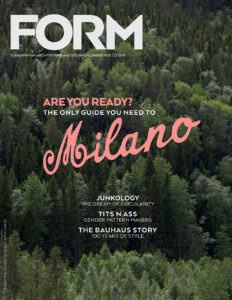 Form 2/2019 – in stores on 9 April.